Whilst sitting for the last two days, full of a cold, plied with warm drinks and watching a plethora of catch up tv I have been thinking how lucky I am to craft so often and meet with lovely like minded friends, new and old, whilst doing so. Last week I helped a friend run a Christmas card making class. We used a dye cutting machine, stamping, glitter dots, ribbons and other embellishments. I managed to snap just a couple of photos before the ladies headed home. Most of them loved the cards so much they said they’d find it hard to give them away! Then Monday night this week I met with other crafty friends for our final pre Christmas get-together to do a joint project. This time was an introduction to origami, making these super stars. There was a bit of wonky folding along the way but we had a good selection of finished ones by the time we were full of wine/cake/the evening was over! I had my sewing machine out at the weekend but can’t show off what I made yet. I will reveal all on a later blog post. 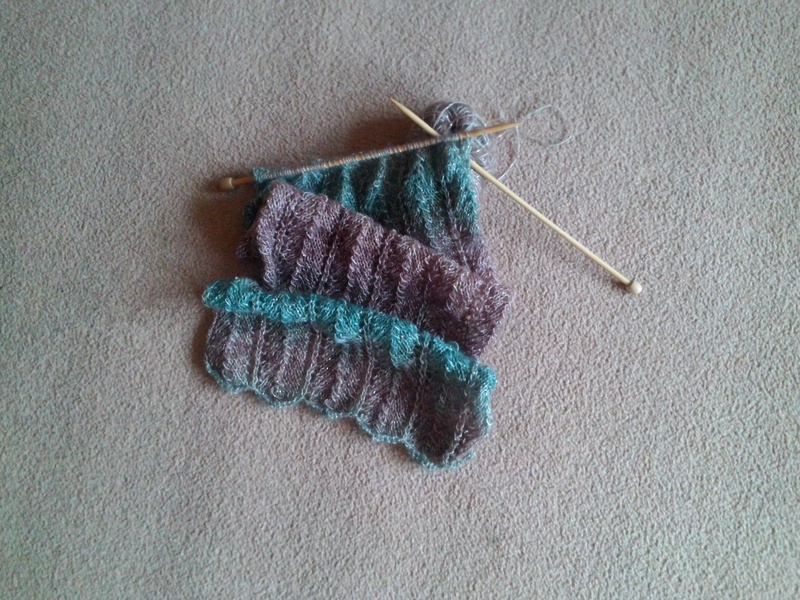 Finally, some knitting, quite a bit of knitting since Sunday. I knit at home in the quiet, when listening to music, when watching tv, in the car, whenever I can really. I knit a lot for myself and for charity and I love gifting to friends if I think they’ll appreciate it though sometimes you are never sure if people really appreciate hand made presents. However, a few weeks ago a good friend (of nearly 40 years, we met when we used to pull each others pigtails!) and I were out walking and I noticed she was wearing a hat I made for her several years ago. She loves the hat but it’s losing it’s oomph and she gently hinted it might be time for a replacement. I’ve made the one she wore several times and was determined not to go down the same route. I chose a new pattern, dived into my stash and .. a lovely new hat is done. I enjoyed making it so much I made myself one too! I shall just have to make sure we don’t wear them at the same time . I also attacked a few more rows with my chunky grey shrug and started a prem baby cardigan as I heard a family member’s latest arrival may be making an appearance sooner rather than later. Now back to the sofa and onto the next Box Set and if my fuggy head lets me a little more knitting too. This entry was posted in Uncategorized and tagged card, handmade, hat, knit, origami, sew.